Effective weight loss happens with the right combination of a balances diet and physical exercise. You can choose between hitting a gym or working out on your own, doing weight, jogging, running and cardio. While most peple underestimate the importance of including cardio in their exercise schedule, the fact remains that it is one of the keys to an overall toned body. Cardio exercises include anything that will increase your heart rate and keep it up for a significant time period. Even though cardio is good for you, you must ensure you do not overdo it. There are limitations. Over doing your cardio workout can soon lead to aching knees, muscle loss and decreased metabolism. The best combination that works for most people is a blend of 10 – 20 minutes of intense cardio and 25 – 45 mins of low intensity cardio. Not only does this not cause any injuries, it also proves to be the maximum benefit routine. High intensity interval training includes 10 mins of intense cardio exercise. It is devoid of warming up and down sessions and, should be repeated every alternate or 3rd alternate day. The intensity of this workout burns energy from the muscles and hence, must not be done every day, giving muscles time to recover from the stress. Exercises involving the kettlebell are whole body workouts and work better than isolation exercises. These are very basic exercises, and are most effective when done for a duration of about 30 to 35 mins. Since the whole body works out in these exercises, you burn a lot mote calories with each repetition. A high intense workout including aerobic exercises and resistance training. The cycles, or circuits, are repeated continuosly, with minimum rest in between. Both aerobic and anaerobic exercises can be blended. You can include exercises you like to create a circuit of your own. As is evident, this involves a stair or a series of stairs. These exercises increase cardiovascular stamina and work miraculously for toning the lower body. It may be slightly strenuous to start with, but you can easily build up on this exercise and also include it in your interval or circuit training. Swimming has been known for a long time to have cardio vascular benefits. Rigorous freestyle swimming can burn as much as 350 calories in just 30 minutes. The breast stroke or butterfly stroke are the best ones for the purpose. 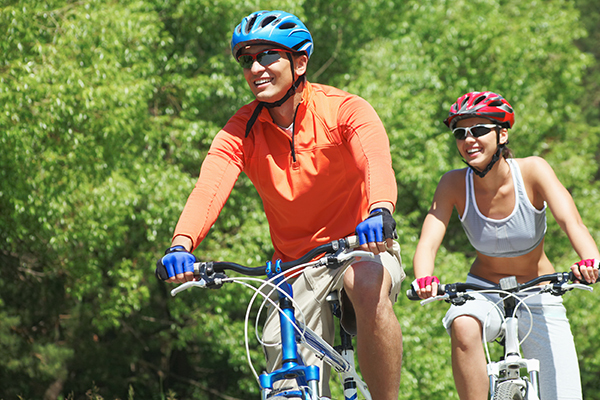 Compared to static indoor cycling in the gym, cycling outdoors works wonders for the overall fitness. The challenge of maneuvering through different terrains and routes can help add to the adventure quotient of a perceived boring activity. The calories burnt during a cycling session depend on the speed of cycling and the resistance offered by the route take. Yoga has always been a great way to mental, emotional an physical stability. Power yoga in a form of yoga where the postures are performed in a temperature controlled room, with greater focus on cardiovascular fitness. Strengthening you abdomen, back, hips and pelvis, it helps to improves strength, stamina, posture, concentrarion and muscles toning.